Colors, by, hmmm I can't seem to find an author for this book. Play Bac Publishing, 2007. Available now. "The Play Bac Edu-Team is the original creator of the very popular BrainQuest Series. They work with a team including teachers, writers, parents,educational experts, graphic designers, illustrators, and even kids, to create fun age-appropriate learning series." This seems to be a series of books that use photographs to help present concepts. 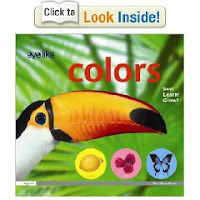 There's an alphabet one and this book talks about colors. I'll be looking for others to drift into the library branch, soon. And, WOW, what COLORS they are, too. Nature's many colors. Take a closer look and you will find a thousand shades, because in nature, no color is the same. They are a lighter yellow!" The red apple is identified as a Red Chief apple, which I have never heard of. And I know most of the apples in the Eastern United States. Oh -- Google says that some Red Chief apples come from France. oh. Leaves shading from green, yellow, orange, brown lead to a (page turn) section about brown things. The dedication inside these books thanks "all the teachers, mothers, and children who have helped develop the eyelike (trademark) series." Since the series was such a group effort, I wonder which one is to blame for the wrong identification in the alphabet book of this series? (Letters the alphabet in the natural world) Under "H" we find a photograph labeled -- hamster. But it's a photograph of a guinea pig. Anastasia Suen has the Nonfiction Monday Round-up at Picture Book of the Day.